Justifying text while setting metal foundry type by hand requires a bit of attention. It's not enough to simply slip in extra spacing where you can. To maintain good "color" for a block of justified text, it is important to adjust spacing between all words in a line. While this may seem tedious at first glance, it is in reality not difficult to do, and was in fact done for hundreds of years before the Linotype became the choice tool of typesetting around 1900. 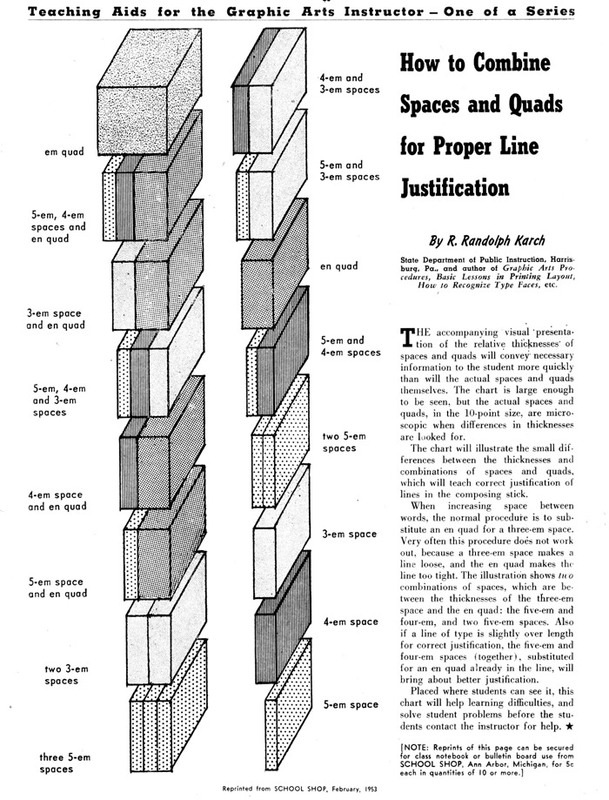 Read Mr. Karch's text below to get a better understanding of how to combine spaces and quads for proper line justification. While mathematical precision would suggest that all words have the exact same amount of spacing between them, there are, of course exceptions. In the case of such exceptions, let your eye be your guide, then prove the validity of your choice with proofs of the text.